Because I often claim my hits, I also have to admit my misses, and I missed big-time on the lead question on this year’s survey. It was about pot, and I figured the industry would be concerned about legal risks. Not so, but more on that in a minute. I was mildly disappointed in the response rate this time, and I credit the abuse that others have heaped upon us all once they get our e-mail addresses. I get surveys from health care providers, merchants, politicians and plain-old John Does. Each says, “Your opinion is important to us.” But it’s not. It’s something for them to sell. I complete the survey, and the next thing I know, I’m hit with another survey or a sales offer, or I just see something I mentioned start showing up on all the pop-up ads on my web searches. We don’t do that, as we have said many times. I asked the pot question, as well as others, to get a feel for what you want in editorial coverage over the next year or so. So you won’t be seeing any pot coverage as a feature. I will, of course, publish any substantial legal consequences we incur as an industry if those occur, because that is the nature of news. Those of you that follow Wood Industry know that we are unique. This is mostly because we will not kneel before commanding suppliers and their hirelings. We have pointed out in the past that some, such as the management at IWF, have admired our successes so much they decided to kick us out and take the keys, with disastrous results. It’s not that easy. So I was talking with Lee Ann about how to help energize the industry when surrounded by pickpockets. I joked, “Maybe I should ask the readers who they think is the most recognizable personality in the industry.” But then I didn’t laugh. What an audacious idea. But then, audacity is not necessarily a vice. And again, since so many wanna-be promoters think celebrity is the only measure of value, I decided to risk it. Pete VanHartingsveldt at Durham Precision Cabinets was enthusiastic, “Kerry Knudsen, and I mean it.” So it was sort of a joke, but it’s serious. We have risked a lot to be for the reader and not the advertiser, and it worked. We will have detractors that say the question is biased. This is exactly the kind of foolishness that the survey purveyors have promulgated on the industry. ALL questions are biased. That is why they are questions. You would not survey people on whether the sun will rise tomorrow, although if you did you would get four percent that claim it will not. The reason I asked the celebrity question, as well as all the others, is because you cannot get an answer if you don’t ask the question. And our questions are pretty well unambiguous and straightforward. All the people in the sample had a chance to answer that question, positive or negative to any “leading” they thought was in process, and all the people that answered are represented in the results. We NEVER skew the results. What professional surveys do to protect against fraud is to make sure the sample is not biased, not dictate the questions. In our case, we sent out surveys until we had just over 10 percent of our subscribers verified as having received the email. Of the verified recipients, 10 percent actually clicked to view the survey, and 56 percent of those completed it. As noted, the response rate is much lower than previous surveys, but still very impressive to those that make a living doing surveys. You are showing you trust us and you care about how you are perceived. On the pot questions, 93 percent of you expect the legalization of marijuana to affect your legal exposure little-to-none (57 percent), or you don’t know but it’s concerning (35 percent). In addition, 80 percent said they think legalization will have no effect on productivity, and another 12 percent say it could decrease productivity up to 15 percent. One percent believes legalization will increase their productivity over 15 percent. Once again, we know we are an industry of small companies, with 86 percent of respondents reporting fewer than 50 employees and 68 percent reporting fewer than 20. 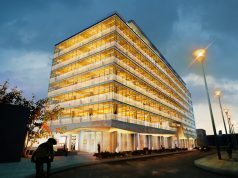 Seven percent report 50 – 100 employees, and six percent report over 100. Ontario had the highest number of respondents, with 48 percent, followed this time by British Columbia at 13 percent, Alberta with 12 percent, the Prairies with 9 percent, Quebec with 7 percent, the Maritimes with five percent and the U.S., another group that does not belong in the survey base, at 3 percent. Nearly half of you, 48 percent, expect next year’s revenues to increase up to 20 percent, with another five percent expecting revenues to increase more than 20 percent. 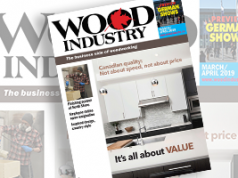 Wood Industry’s monthly e-letter remains very popular, with 80 percent saying they read it immediately every time it comes (12 percent) or every time it comes when they get around to it (68 percent), and 94 percent say they want it to keep coming at the current frequency, which is once a month. The celebrity question: I got 13 percent of total respondents, but just over half of total respondents skipped the question. Mike Holmes came in tied with Paul Epp at 2 percent and the rest was a jumble, including Home Depot, Building Construction Canada and some others. No other publication, association leader or trade show personality was mentioned. I will repeat, that was an immodest question and one I had to swallow hard to include, but I was curious. Others can have their opinions, but they had a chance to register them on the survey, so we are stuck with the results. 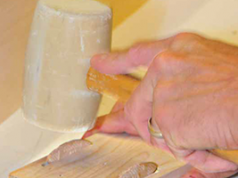 Wood Industry matters to manufacturers because manufacturers matter to Wood Industry. Go figure. 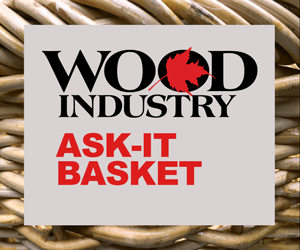 We will publish the compiled results at www.wood industry.ca, and we will publish ALL the comments regarding what we can do to improve, and what you have on your mind. Importantly, 100 percent of you said Wood Industry is informative (63 percent) or somewhat informative (37 percent) so we even got the no-sunrise-tomorrow crowd with us.